The Milwaukee Bucks won’t have much time to dwell on what might be their most embarrassing loss in recent memory. Fresh of a dominant thrashing of the Western Conference’s top team, the Portland Trail Blazers, Milwaukee came out Friday night and laid an egg against one of the West’s worst teams this year, the Phoenix Suns (4-14) who handed the Bucks (13-5) a 116-114 loss. Giannis Antetokounmpo scored 35 points on 14-of-16 shooting with 10 rebounds but the rest of Milwaukee’s starting five failed to match his effort for most of the night. The quick turnaround should be a benefit as Milwaukee tries to close out its season-long six-game home stand on a high note. There was plenty of blame to go around but seeing Brook Lopez struggle with his shot was one of the more unexpected surprises from an all-around ugly night. Lopez hit just 3 of 17 shots and was 0-for-12 on 3-point attempts and while head coach Mike Budenholzer admitted Lopez’s struggles were shocking but expected the veteran center to bounce right back. The Spurs (9-9), played Friday night, too. They knocked off the Pacers 111-100 in Indianapolis to snap a two-game lost streak. San Antonio had lost seven of nine overall heading into the matchup against Indiana largely because LaMarcus Aldridge had been playing well below the level the Spurs had come to expect. 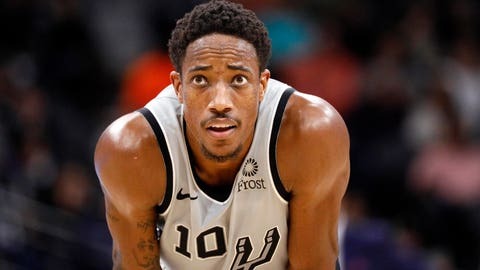 He was shooting 40 percent entering play Friday but knocked down 14 of 25 shots and finished with 33 points against the Pacers, with DeMar DeRozan adding 16 points, Patty Mills finishing with 15 and Bryn Forbes and Rudy Gay adding 13 and 11 points, respectively. After sweeping the season series for the first time since the 2009-09 campaign a year ago, the Bucks have won three in a row against San Antonio — their longest winning streak in the series since taking six straight between November 1999 and December 2001. Budenholzer, in his first season at Milwaukee’s helm, spent 17 seasons as an assistant on Popovich’s staff and helped guide the Spurs to four NBA titles during that stretch.